During the height of the Vietnam War, Real American Hero Captain Rosenblatt (Sperry), who is the ultimate badass hardass, corrals the best men he can find to become tunnel rats. If Captain Rosenblatt wants you to do something, you sit up and take notice. For this amazingly dangerous mission, his top choice is Sgt. Bruce Burns (Gilbert), a young and talented soldier. While Rosenblatt has specifically warned his men not to get involved with the women of Vietnam, Burns and translator Kama (Nocon) end up falling in love. This shouldn’t distract from the main mission - find and kill the baddie of baddies, Commander Van Dram (Katana), who has been capturing, torturing, and killing Americans. He even has a special torture technique that will make your eyes bug out...on top of all this, Rosenblatt has to defend himself against charges of being involved in something called the “Ling Nam Massacre”. Prepare to enter the tunnels of hell...who will get out alive? Find out today! To quote the name of the great website When the Vietnam War Raged In the Philippines, here the Vietnam War is raging...in the Philippines! 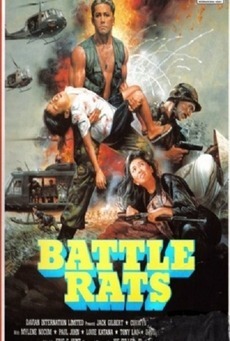 Anyone who just can’t get enough gun-shooting, hut-exploding jungle action where countless Asians in those triangular rice paddy hats get shot in the head, this is the movie for you. But this one concentrates on what was going on underground while huts exploded above them on the surface, so that sets it apart. Another thing that sets it apart is the majesty of our new favorite human being, Corwyn Paul Sperry (AKA simply Corwin Sperry, with no “Y”). A constantly yelling, cursing, emotionless, mustachioed war leader, he makes Sgt. Slaughter look like Art Garfunkel. If we had more men like him in our military, we might’ve actually won the war. 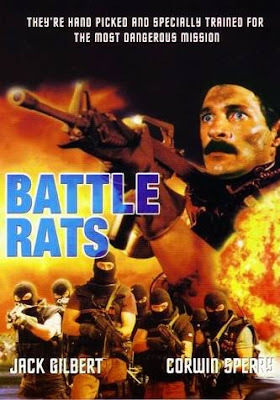 While Sperry has also appeared in the classic Phantom Soldiers (1987) and The Expendables (1988), sadly, Battle Rats is the only film role to date for Jack Gilbert. A shame, he could’ve been the next Richard Norton. Also worth noting is the presence of one David Giberson, who plays the immortal role of Kerbie. His line readings are worth their weight in gold. He also was in Savage Justice (1988) and Saigon Commandos (1988). The 80’s were truly an amazing time, and if you were lucky enough to be in the Philippines then, you might have ended up in one of the many, many war movies that were being made there. It was a golden era never to be duplicated. Clearly whoever wrote the movie, if indeed any of this was written down on paper, was not American, and, we presume, had a limited grasp of English. Hence, they - and the actors - stumble accidentally into some killer dialogue. It’s hilarious to think that this is what anyone believes Americans sound like. Most of the “Americans” on the tunnel rat team have some kind of thick accent or another. We know we had some international cooperation in ‘Nam, but this is ridiculous - ridiculously entertaining, that is. However, and this may seem like nitpicking, the movie probably doesn’t need to be 93 minutes - 85 to 88 would have sufficed. There’s only so much skulking around in poorly-lit tunnels and machine-gun shooting anyone can reasonably stand. That said, overall this movie is a winner, thanks to the personalities involved, mainly the great Sperry. Also featuring the time-honored barfight (this time, interestingly, with no music - especially when the soundtrack is pounding away most of the rest of the time), some highly-informative tunnel training, and the ever-evil hair of Van Dram, chalk up another winner for Davian International, the company primarily known for the vast majority of Dale “Apollo” Cook’s career. They also made a clutch of non-Apollo movies, and this is one of them. Copyrighted in the golden year of 1989 but released in ‘90, Battle Rats is another for our case file of why the 80’s ruled - and “Namsploitation” fans will surely get a kick out of it. We watched it on Youtube. Haha. Ah cool, there's another cool film on Youtube you should check out- The Olivier Gruner film Deadly Engagement. Speaking of Gruner, we are doing Gruner week starting Sunday! 4 Gruners.